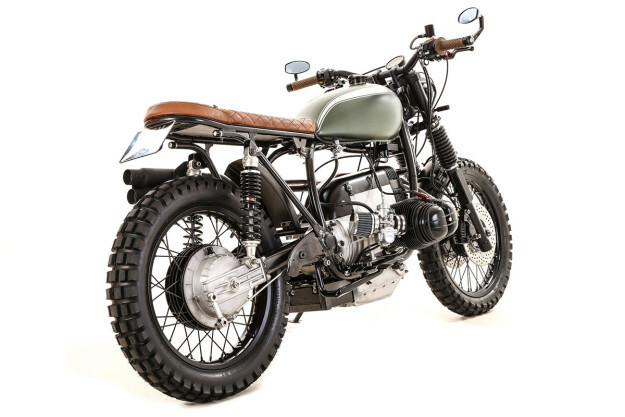 Custom BMWs are all the rage right now. But one workshop in England was producing stunning airheads way before they were cool. 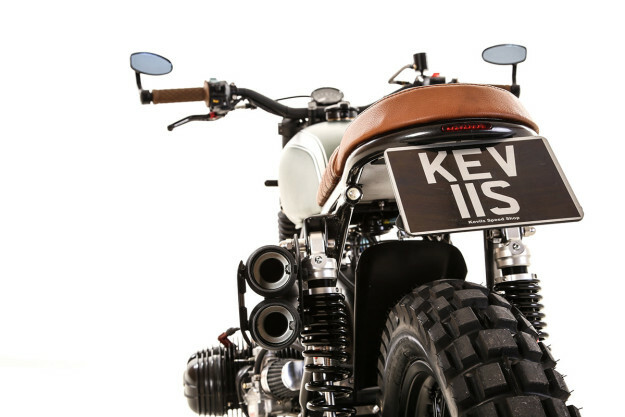 Kev Hill and his crew at Kevil’s Speed Shop have been at it for six years, and over seventy builds have rolled out of the workshop in picturesque Devon. So they know their oats, and have clients lining up around the block: they’re turning out a new Beemer every three weeks. 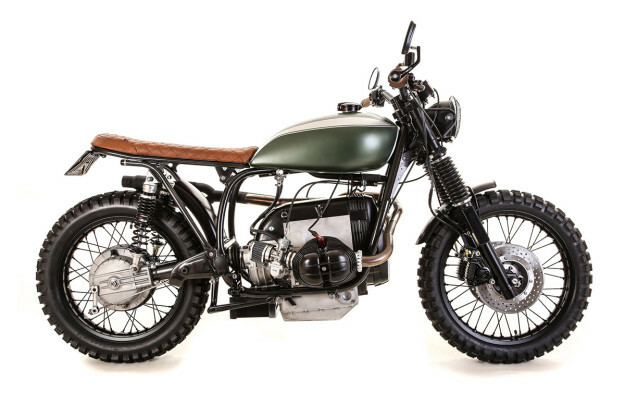 It’s loaded with bits and pieces that Kevil’s have developed over time—like their bolt-on, scrambler subframe. 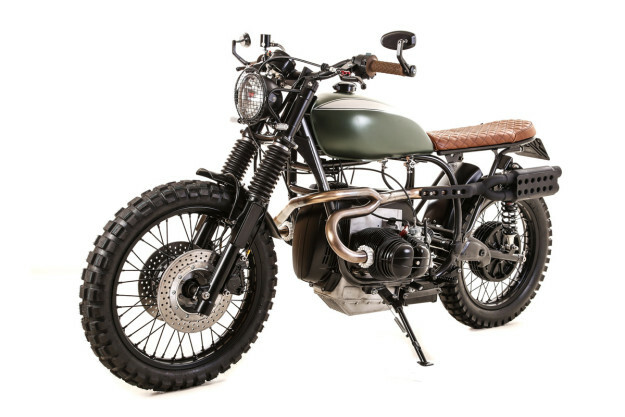 Combined with a diamond-stitched, tan leather seat and a Kawasaki KZ400 fuel tank, it makes for a much skinnier profile. It also houses the tail light (in the rear loop), and rear turn signals (in the ends of the support rails). Underneath the seat, the team removed the airbox, and fitted an aftermarket cover to round off the engine’s profile. The battery’s been relocated to under the bike, and an inner fender’s been installed. 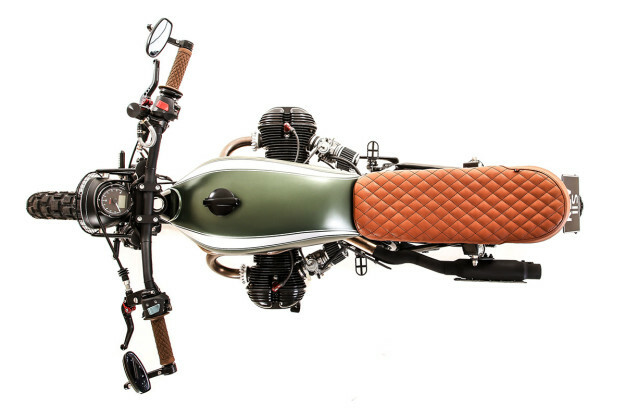 There’s also a tiny fender up front, mounted on a custom-made fork brace. The high, stainless steel, two-into-one exhaust system is another part that Kevil’s have been working on. 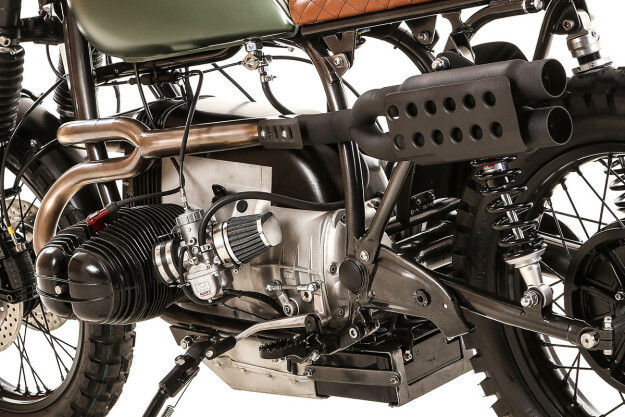 On this bike, they’ve paired it with twin shorty silencers, “for that perfect burble.” The system’s devoid of any pipe wrap—adorned instead with a set of hand-made heat shields. New parts include a set of rear shocks from YSS, Continental TKC80 tires and serrated foot pegs. The cockpit’s pretty kitted too—with fatbars (and new risers), new switchgear, adjustable levers, a new brake reservoir and Biltwell Inc. thruster grips. 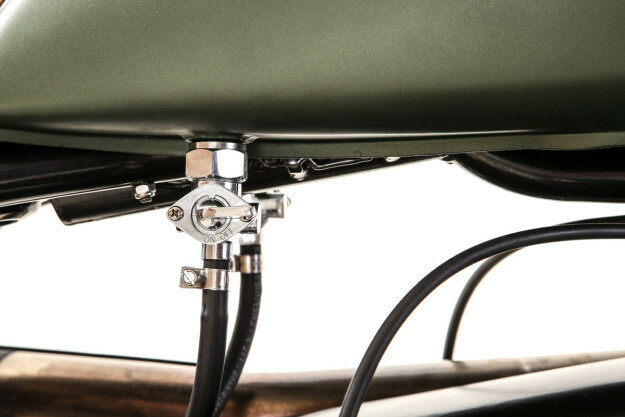 The speedo’s new too, as is the swanky halo headlight—mounted on custom brackets with an integrated grill. Everything’s been stripped down and refinished—including a new graphite-colored coat for the frame, and black for the spoked wheels, silencers, fenders and bits of the engine. For the tank itself, the client picked a color out of the BMW and Mini swatch book: “Jungle Matte,” with contrasting silver stripes. 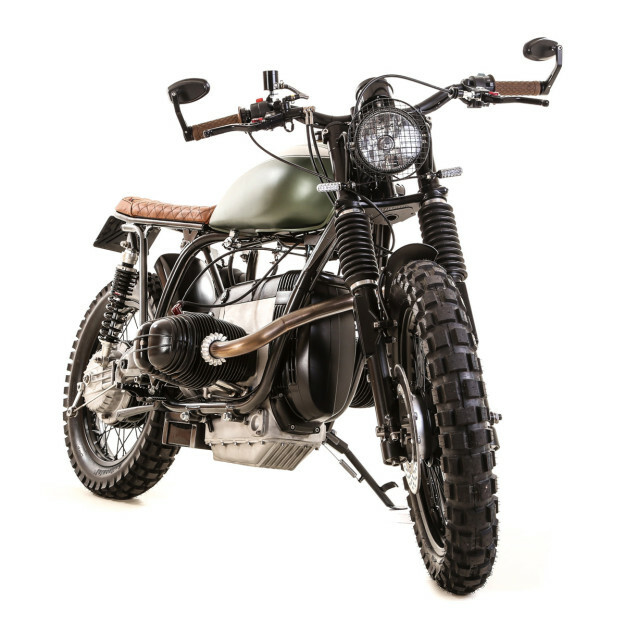 It’s a slightly military look that goes well with the BMW’s utilitarian nature. Would we ride it? Yes sir, we would.